ESA Legislation Introduced In The Senate! We are very excited to see ESA legislation introduced in the Senate! Senator Jerry Behn (R-Boone) introduced a similar bill last year. The bill was voted on as an amendment near the end of last year’s session and failed on a bi-partisan tie vote. This year, Senator Behn has a new bill and 24 co-sponsors! Thank you to each and every one of them for their willingness to support school choice for Iowa’s parents and students! You can see the bill on the legislative website. We will continue to work with our school choice coalition partners to build momentum for ESAs and other school choice legislation. ESA Action Alert! Huge Response So Far! Our Action Alert on the House Education Savings Accounts (ESA) bill has received a huge response! Between IACS and our school choice coalition partners in Iowa, we are becoming convinced a record number of emails have been received by Representatives in the Iowa House. HF 2090 is out of subcommittee and will now be considered by the full House Education Committee. Its future this year isn’t certain. Between a supposedly shorter session this year and the nature of passing a new idea that is opposed by the champions of the status quo, we have our work cut out for us. We are, however, extremely encouraged by the grassroots support for ESAs across the State. If you have not emailed your Representative yet and asked him/her to support HF 2090, please do so by clicking here right now! We need all hands on deck to let the legislature know that Iowans are serious about not only starting this discussion, but taking action as soon as possible! Today in the Iowa House, a number of bills supported by IACS cleared hurdles and advanced to the next stage of the legislative process. House File 2090 (Education Savings Accounts) passed out of subcommittee today and will move to the full Education Committee in the House. This bill has significant opposition from public school groups and we urge you to keep an eye open for a call-to-action very soon. Be sure to sign up for our email list to ensure you get the action alert as soon as it comes out. We’ll do our best to keep you in the loop on bills that impact your school. Please feel free to peruse the list of bills on the DE website and let us know if you have questions or concerns about any listed. Education Savings Account Legislation Introduced! 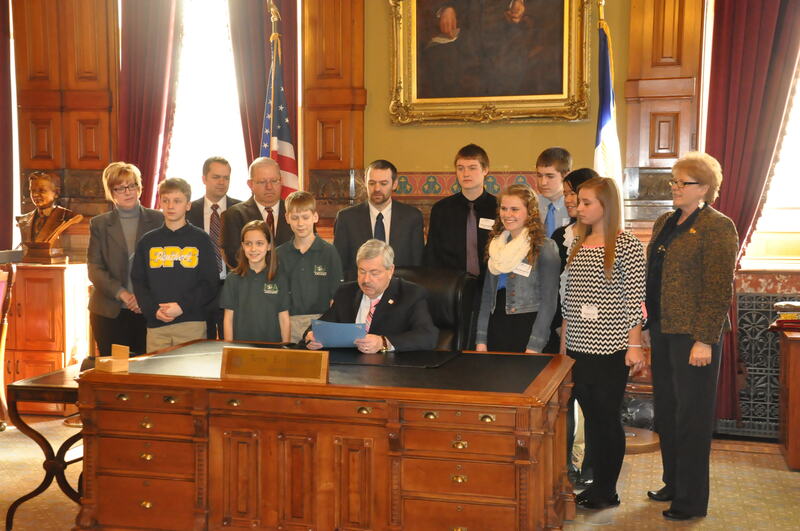 For the first time in the Iowa House, Education Savings Account (ESA) legislation has been introduced! House File 2090 would authorize the state to fund Education Savings Accounts for each student outside of the public school system. The amount would be the average basic state aid for public school students, this year about $5,580. Those funds can cover private school tuition and fees, and/or some private instruction, tutoring, and educational therapies. We believe this proposal offers true freedom of choice in education to all families. You can learn more about this unique school choice concept and how it would work by watching Iowa Alliance for Choice in Education’s (Iowa ACE) YouTube video on ESAs. Iowa ACE will be leading the charge on this legislation and we’ll be with them every step of the way. Rep. Chris Hagenow (R-Windsor Heights), Rep. Jake Highfill (R-Johnston) and Rep. Peter Cownie (R-West Des Moines) have sponsored the bill. Please be sure to sign up for our email list and we’ll keep you in the loop on the latest news and calls-to-action.